This is a commonly used technique, and has gained wide acceptance in New Zealand for surveillance and monitoring. We recommend this technique for surveillance and monitoring. Typically a non-toxic bait is placed into a small plastic vial. The bait attracts ants, who recruit other ants to come and collect the bait and take it back to their nest. Types of baits that we recommend for use include (see Control section). Baited vials are placed out of the sun with lid off for a minimum of 3 hours. Baits can be left out for quite a long period depending on your specific conditions, even up to 24 hours. However, the longer vials are left out means the bait will more likely dry out and become unpalatable, or vials may be vandalised. Vials are usually spaced about 10 m apart, in groups of 10–20 vials. However, for more intense monitoring, spacing can be reduced to less than 5 m apart. Vials need to be plastic (to reduce breakage) and numbered so that specific locations can be found again if Argentine ants are detected. 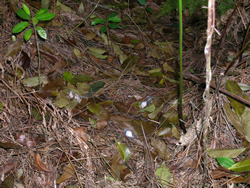 Baiting gives information on presence and absence of Argentine ants. In addition, it can also gives a rough indication of abundance. Note: ant abundance is extremely difficult tio measure accurately (because it is so variable), so ant abundance in baits should be treated only as a rough guide.